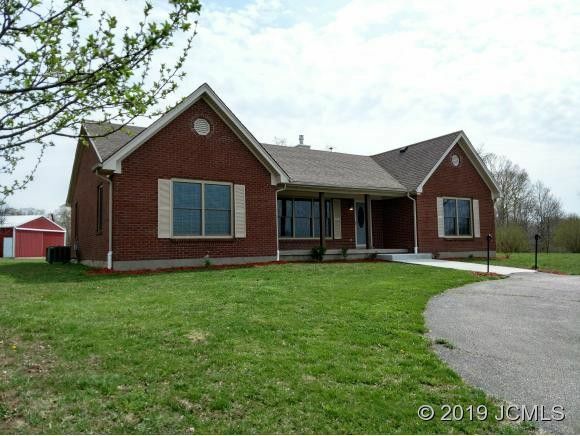 Fantastic updated brick home on over 50 acres! Sit on the covered front porch that overlooks beautiful rolling green hills pastures and two creeks. Two large outbuilding (30x40, 30x50) and fenced area for livestock. The 30x40 is a new construction with a 10x12 insulated overhead door. Encapsulated crawl space with radon fan.In 2015 there was a complete renovation that includes: new Pella windows, some new plumbing, new wiring, new cabinets and countertops, light fixtures, tile in bathroom and kitchen as well as new sidewalks outside. Living room features a fireplace with gas logs. Beautifully tiled showers and bronze finish features give the bathrooms a luxury feel. New carpet, alarm system. Whether you are raising a family, this home is worth a look! Lockbox on gate at end of driveway.